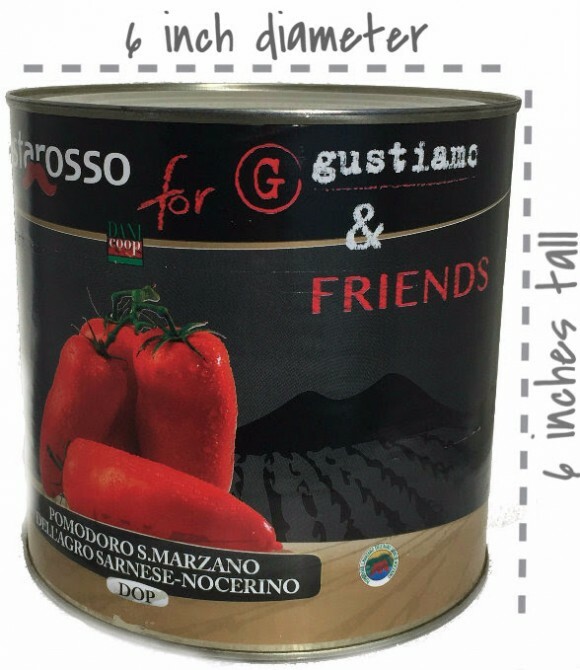 The Biggest Can of San Marzano Tomatoes. New! This can of tomatoes is 2.5 kilograms. That’s 5.5 pounds. That’s A LOT of Real San Marzano Tomatoes. Previously, this size of San Marzano Tomatoes was only available to chefs and pizza makers. But now, all of the USA has the chance to make sauce like the professionals. Edoardo is the man who sells Gustiamo San Marzano Tomatoes to the best chefs and pizzaoli in the USA. They ALL buy this big can. Edoardo says, you can make 25-30 Napoli style pizza pies with 1 of these cans! He also suggests using this can to make a big ol’ pot of Sunday sauce and inviting all of your neighbors. Or, make a batch of sauce and freeze to enjoy later. Can’t use the whole can? Edoardo says that these tomatoes also freeze great on their own!